Over at January's blog, Deb recommended this site, which has lots of ideas for how to promote a book. I suspect that many of us who have been following publishing can be surprised at how much we'll need to do to support our books. Still, it's always good to have some fresh ideas. I'd also recommend this page of the 52 Projects website. Lots of great ideas here. A book I return to again and again is 101 Ways to Make Poems Sell: The Salt Guide to Getting and Staying Published by Chris Hamilton-Emery. Go here to read the first chapter. If you've been submitting to journals for any length of time, the 50 Dos and Don'ts at the end of the chapter will probably seem self-evident to you. But the rest of the book is full of good ideas to help you build your profile and sell your book. When I was in grad school, one of my friends who focused on Composition and Rhetoric told me that until very recently, students learned to write expository essays by copying, word for word, essays from great masters, usually Greeks and Romans. There was no talk of pre-writing techniques, no discussion of revision. No, you copied out Cicero, in your own handwriting, day after day. Eventually, you might be allowed to write an essay that had your own original thought. I saw a posting on Leslie Pietrzyk's blog that made me think of this technique of teaching Comp-Rhet, except it's a poetry technique. Guest blogger Judy Leaver describes a technique that Billy Collins used in a workshop that he led in Key West, where students used a William Carlos Williams poem, "This Is Just to Say": "Our homework was to ‘copy’ the exact form—same title, exact line length, same punctuation or lack of, and number of syllables/per line . . . ." Go here for more details about the assignment and to see the results. Those of us who teach are getting to the point in the term where we often find ourselves saying, "Are you sure the term isn't over yet? We still have to keep going? For weeks? Months even?" Our initial enthusiasm has waned. We know we had good ideas at one time, but we can't remember what they were. It's good to have an assignment like this one, one that would work in a Creative Writing class, in an Intro to Lit class, and even perhaps in a Lit Survey class. And it's a change from the analytical assignments that have begun to get so tedious. Why write about literature, when you can get right in there and wrestle with the literature itself? Soon I leave for church. No longer do churches have a Shrove Tuesday pancake supper and then the next day, an Ash Wednesday service, at least not down here. We'll have a pancake supper and move into Ash Wednesday. We'll get our foreheads smudged with ash and be reminded that we're made from dust and all to soon, we'll return to dust. If you want to read more of my theological thoughts on Ash Wednesday and the season of Lent (and other topics), head over to my other blog. I've written several poems that I really love that focus on Ash Wednesday, but so far they haven't been published, so I don't want to post them here. But when looking through my files, this poem seemed appropriate. I wrote it during my adjunct years, when I drove across three counties, filling my gas tank several times a week, teaching Composition here (and there and everywhere! ), Literature survey classes there, Victorian and Romantic Lit classes in yet a different location. I had just taught Julian of Norwich, and I was thinking of her days as an anchoress, when this poem came to me. It was published in my chapbook, Whistling Past the Graveyard. I sing constantly and pray without ceasing. showing my devotion in twelve hour increments. myself with my cell phone and briefcase. tempting me to tame my frantic schedule. As we got settled the other night in the theatre, I watched the ushers and remembered my own ushering gig at the Koger Center, during graduate school. I said to my husband, "That was a great job, except for having to deal with the public." But we got to see great shows and great performers for free. I saw Sarah Vaughan in what would be one of her last performances, for example. When economic bad news comes in waves, like yesterday's stock market drop, I fight off my panic by saying, "I can cope with a bad economy. I made it through grad school." In a way, grad school was a bargain. I had a teaching assistantship, so I was paid a pittance and my tuition was only $200 a semester, which could be taken out of my paycheck. I made it through a PhD program without taking out any loans. I lived on very little. There was always that edge of financial terror, but we learned to live with very little money. Of course, it helped that all my friends were similarly situated. Instead of going out to eat, we cooked meals together, usually vegetarian because we couldn't afford meat and some of us had ethical concerns. When we weren't ushering, we played games or watched videos that we checked out of the library. We went on long walks and attended free festivals at local parks. If it hadn't been for the constant worry that I couldn't stretch my paycheck to cover my bills, I'd remember it as a great time. I had a similar experience when we moved to Florida, and I strung together adjunct jobs while looking for a full-time job. The constant worry about money was exhausting, as was the need to always be working 6 months ahead to make sure I had enough classes lined up. But there was something exhilarating about setting myself free from some of the constraints of the capitalist system. We may be moving towards an economy where more and more people feel that exhilaration and terror, that freedom from an ordinary full time job. NPR's Talk of the Nation recently ran a piece on the gig economy; go here to hear it. When I was 12 years old, if you had asked me to envision my adult life, I would not have talked about poetry or teaching English. I'd have assured you that I was going to be an actress--on Broadway, thank you very much, none of that tacky movie or television work for me. No, my art would stay pure--and yes, I was so much of a budding drama geek that I probably would have used that language. Clearly, my adult life has not gone as my teenage self would have planned. Seeing A Chorus Line last night brought back a flood of memories. I find it fitting that I decided to go see a travelling Broadway show--one that's over 30 years old--instead of staying home to watch the Academy Awards. I loved seeing it, but I have no idea if I would have loved it so much if I didn't have that emotional connection. My sister and I memorized the whole album when my mom got it for Christmas in 1977, and in 1979, my fearless parents took us from Montgomery, Alabama to Atlanta to see the touring Broadway show (I was 13, and my sister was about to turn 9). This show has been part of my life for a very long time. Would I love the show as much if I had been, say, an aspiring astronomer? If I had grown up to be an accountant or a marine biologist? My spouse, who went to the show with me, says no, I wouldn't love the show, that I'd see these dancers as silly dreamers who need to grow up and get real jobs. As I watched the show, I thought about how preparing for the grown up life as that I thought I would have as an actor has prepared me in unique ways for the grown up life that I do have as a poet and an academic. For one thing, I've known from a young age that I need to have a tough skin when it comes to rejection. I'm not one of those poets who shrivels up and refuses to submit any poems for half a year when I get a rejection slip. Nope, I just send out the next batch of poems and keep hoping for the best. In the past, when I've applied for full-time teaching work, I've realized that the odds were stacked against me, and I haven't taken rejection personally. As in acting (and book publishing) there are only so many slots, and there are so many more qualified applicants than slots. And my drama background has prepared me for a life in front of students. My classrooms are rarely boring. I have an amazing energy, and I have a wide range of techniques to keep people riveted. At the very least, I know enough to vary my vocal tone, which is something that so many faculty and other public speakers never seem to understand. I have read so many plays and poems and other types of literature out loud that I have no problems with cold readings. I worry that we're about to see the same kind of contractions in higher education in the coming decade that Broadway saw in the 1970's onward. We've seen a lot of tenure track jobs evaporate, so that academics have a lot in common with dancers and actors--working gig by gig, stringing together enough work to pay the bills. Now I worry that we'll see a lot of schools and colleges close in the coming decade, and academics won't even be able to find adjunct jobs. But I'll take a page out of the songbook: "Won't regret, can't forget, what I did for love." I'm lucky that I've been able to do what I love: college work in drama, journalism, radio; graduate work in British literature; a wide variety of teaching work; time to craft poems, stories, and a variety of types of writing. If I had a chance to do it all over again, I'd sign right up! Yesterday, I took a nap under a quilt that I made several years ago. I decided to leave it spread out across the bed for the evening. "That quilt is one of the most beautiful things I've ever made with my own two hands," I said to my husband. That started me thinking about whether or not that statement is true, the origin of the quilt, and the other creative projects which engage me. I made the quilt because I had so many leftover pieces of fabric from other projects. I cut out long strips because I like sewing long seams, so much of the quilt is composed of foot long strips which are 3-5 inches wide. I decided early on to sew 5 strips together and then to work on a different batch of strips (perhaps later today or tomorrow, I'll post a picture--you can have fun seeing if it's what you visualized when you read my words, but I'm not sure I want to know how accurate my descriptive writing was in this paragraph). When you look at the quilt, it looks planned. All the colors go together. You might think that I planned it all out from the beginning, but I didn't. I had certain colors in mind as I bought more fabric to go with the project, but I didn't have a firm plan. I didn't say, "This blue will go here, and this purple here, and I'll put this piece way over here away from them." Later, I laid the patches of 5 strips across my living room floor and moved this patch here and that patch there until I had the most pleasing pattern possible. And then began the long work of stitching them together. And then the long work of quilting. Assembling a book of poems is much the same. We write individual poems, and often, most of us don't have a plan for a final book. Those of us who have been academically trained may sense themes and images that emerge, and maybe our academic training means we'll sense that earlier--or maybe it gets in the way. Most people I've read about assemble a book of poems much the same way I assembled my quilt: they put poems beside each other and see how they interact. They move poems around until they have sections of the book that work best. Like a quilter, we often don't understand the scope of the project when we begin to write our poems. We stitch our words together, and then we quilt our books together, and hopefully, at some point, we can look back and say, "How did I do that?" Hopefully we will be amazed by the beauty of our work, by the mystical strangeness that could have only come out of our heads and hands. Yesterday, I spent a small fortune mailing manuscripts to various publishers. My poetry manuscript and cover letter came to less than 80 pages, and I still paid $4.55 per envelope. For just a few dimes more, I could have upgraded to Priority Mail, but I was afraid that would look too needy. And postage rates are going up in May. Again. Two more cents. I wish they'd just raise our rates 8 pennies to get us to an even 50 cents, and then quit raising the rates for a few years. I know, I know, I should just get that stamp that will always be a first class stamp, no matter when you bought it. A few years ago, I thought about buying them, but I foolishly thought we were done with postage increases for awhile. I'm glad that I turned my attention to poetry and away from my novel manuscript. How much must it cost to mail 300-400 pages? With postage rates on the brain, I was happy to see Diane Lockward's latest post on journals that accept submissions via e-mail. I was slow to adjust to this submission method, but in some ways, I now prefer it. However, I'm still one of those strange people who loves the minute she pulls the paper mail out of the mailbox. It's a thrill unmatched by e-mail or other ways of communicating. I love opening the envelope, hoping for good news. I know that the best news--book publication!--is likely to come by way of a phone call or e-mail, but I still love that moment in the day when the mail comes. Unlike e-mail, it only comes once a day. I can get the mail and then get on with the day. E-mail requires constant checking, and perhaps that's why it doesn't have the same thrill. I've been reconnecting with old friends on Facebook, which of course has led me to think about past days that I don't think about very often. A few days ago, one of my fellow college journalist friends Friended me, and I started thinking about how my college newspaper experience is very similar to blogging. My journalist friends were different writers than I was (my primary love was always creative writing, but like many writers, I'd try my hand at any type of writing--and the newspaper needed writers). We had all grown up in the aftermath of Watergate, and we all dreamed of being Woodward and Bernstein--or Hunter S. Thompson. We watched All the President's Men and dreamed of all the corruption we might uncover. We watched Where the Buffalo Roam and proclaimed that life could never get weird enough for us, and tried to figure out how to get alcohol into grapefruit so we could have theatrical props. We dreamed of the great stories that existed on campus, just waiting for someone to come along and expose them. I had a similar experience with campus radio. We had bought one hour a day of radio time from the local radio station, and we could fill it however we wanted, as long as we had no profanity. That hour must have been the strangest to fill the airwaves over Newberry, South Carolina. I often wondered how many county residents kept the radio tuned to what we were playing. I saw myself as a missionary of modern music, placed there to expose people to all the music they didn't know existed. One reason that I didn't follow my passion into the grown up world of journalism or radio is that I knew that I wouldn't be allowed the same kind of latitude I'd been given in college. I'd be given boring stories to write, and for 10-20 years, I'd write them, hoping that some day I'd be given freedom to follow my own interests. If I worked in radio, I'd have to follow a strict playlist. But the Internet gives us all the freedom I had in college. Blogging allows me to write about what interests me, and if I'm lucky, maybe others will be interested. I have friends who have explored Internet radio stations because they love the freedom. If we can afford the Internet connection, we have fabulous possibilities to explore. And I can't help but be thankful that I didn't follow my college interests and head off into the worlds of journalism or radio--those industries have contracted sharply since my college days. I do worry that my current career field, college education, is about to experience similar contractions, but most days, I think that I can continue to carve out a living. And maybe all these new media incarnations will open doors that I don't even perceive yet. I'm grateful to live in this world of both new and old media, where I can read The Washington Post online, reconnect with lost friends through Facebook, have worlds of information available without having to go to the library building, and have new outlets for creative expression. And when the power is out or the Internet isn't available, I still have more books on my bookshelf than I'll ever be able to read in one day--or year (but probably not enough for my entire lifetime). On Inauguration Day, I drove to Delray Beach to hear Denise Duhamel read at the Palm Beach Poetry Festival. I gave myself plenty of time, since I expected rush hour traffic. Of course, when you give yourself time for rush hour traffic, you might not need the extra time. That's how I ended up in Delray Beach an hour early. Happily, Books and Books was there to sell the books of the authors appearing at the Festival, and even more happily, I got Denise Duhamel's book, Ka-Ching!, before its release date. I went into the auditorium and dug right in. And since I didn't have the distractions of the computer, the television, colleagues or friends, I got a lot of reading done. When I feel despair about the reading I'm not doing, I remind myself that I'm not commuting (I used to read several books a week when I could take public transportation to work) or travelling by airplane as much (again, I get a lot of reading done on airplanes). I read Denise Duhamel's book, and then--even more delight! Much of her reading came from her new book. One of the themes that weaves its way through the book is the way that money shapes our modern society, for better or worse. The book opens with poems that are printed on shaded rectangles of paper on the page. During the reading, Duhamel held up some paper money from a board game and told of how she wrote the poem on the actual piece of play money. The piece of paper served as a limiting agent, much as a formalist form both limits and liberates. Duhamel's book includes many poems written in form. One of my favorite villanelles is Duhamel's "'Please Don't Sit Like a Frog, Sit Like a Queen'"--in fact, I bought The Best American Poetry 2006 in part to have a copy of that poem. Her book also includes poems that include some word play, like "Anagram America" and "Delta Flight 659," which is sort of a sestina and sort of a sestina-like poem that incorporates the word pen into the end word--the poem got its inspiration from Sean Penn and a Delta flight. Duhamel's signature humor and fascination with popular culture are here in poems like "Dinner Party Horror," where we see people analyzing the parts they would play in a horror movie. But Duhamel shows that she's equally capable of serious subjects, with an extended poem sequence about a horrifying elevator accident suffered by her parents. It's fascinating to be reading this book as financial structures melt down one after another, and we watch our elected leaders trying to determine how to fix everything. Duhamel's poems remind us that real humans are behind the news stories of financial crisis. Her poems also remind us that many life markers that look like a crisis at the time are survivable (and even humorous years later), and her optimistic reminder of the incredible resilience of many people refreshes the reader. At the end of the year, I noticed that Kevin Prufer's National Anthem was on several Best Poetry of 2008 type lists, so I added it to a recent Amazon order. I read it in one sitting. I could not put it down. I find myself thinking of it often. It has an apocalyptic theme, as it wrestles with issues of empire and the end of empire and death. For people who want their poetry to uplift them, this may not be the book for you. But if you want your poetry to make you see the world differently, read this book. I know that many poets wrestle with the idea of how to put a volume of poems together, and this book would be a good example of a book of poems tied together by theme. I don't think I see any kind of narrative arc; the volume begins in bleakness and ends in bleakness. It's strange that I found bleakness a reason to not fall in love with Slumdog Millionaire. I liked the movie well enough, but I didn't find it uplifting, the way some people promised that I would. The unrelenting depiction of poverty in the movie was almost enough to make me leave midway through; I thought, I just cannot take this anymore. But I don't feel that way about Prufer's National Anthem. When I was young, my parents told me that words were less disturbing than images; thus I was allowed to read almost anything, but they monitored what movies and television I saw. I wonder if a similar dynamic is in effect. Or perhaps it is that his figurative language is so breathtaking that I forget about the bleakness he's describing. In my 2009 reading plan, I said that I would read a single volume of poetry each month, in addition to all the other books I said I would read. National Anthem was my book for February. 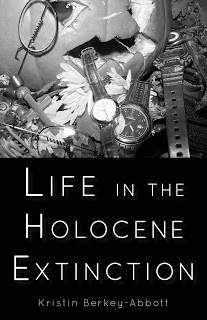 Tomorrow, I'll blog about Denise Duhamel's new volume that I read in January. At the end of last year, I made a list of all the books I planned to read during 2009; go here to read the original post. I've been interested in how the books on the list are intersecting and juxtaposing, as I read them. Sometimes the connections are obvious. I noticed an apocalyptic theme as I organized the list. But sometimes I'm seeing connections I didn't anticipate. For example, I've been dipping in and out of Wastelands, a book of apocalyptic short stories. And then, last week I consumed Toni Morrison's A Mercy. I cannot recommend her book enough. I love that it's relatively short. I love that it shows me a view of colonial life (about 1690) that is fresh to me; we often forget how disorganized our American colonies really were, and this book sheds light on that fact. This book also makes me once again appreciate being born female in a later time. It also makes me feel fretful, because I know so many females don't share my luck, even though it's the 21st century. There's an apocalyptic tone to her book that I didn't expect. The new world in the book is shown as full of opportunities, but there's a dark edge to her depiction. These female characters are perched on a precarious brink, and it doesn't take much to make them tumble. And of course, with Toni Morrison, there's lyrical language that I love. I know that not everyone shares my preference. I knew my participation in a writer's group was doomed once, when the dominant member was reading The Bluest Eye, back when Oprah picked it, and couldn't understand all that "crap" that doesn't really advance the narrative. I quietly said, "That's the artistry in the book." I also love Morrison's ethics lessons throughout. In many ways, the last sentences of the ending chapter sum it all up nicely: ". . . to be given dominion over another is a hard thing; to wrest dominion over another is a wrong thing; to give dominion of yourself to another is a wicked thing" (167). For those of you who want more information on this book (either before or after reading it), Diane Rehm had a wonderful interview with Toni Morrison in December--go here to hear it. On the Historiann blog, Ann M. Little writes about the book from a historian's point of view--go here to read that post. 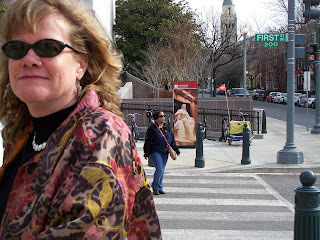 It's funny--when I first started blogging, I had decided I would be fairly anonymous. I tried to disguise the town I'm living in, that kind of thing. I still try not to talk about work in terms that are too specific, and I worry about the privacy concerns of others. Of course, the idea that any of us have private lives if we're on the Internet at all is fairly absurd. So, here I am, about to fully blow my cover. 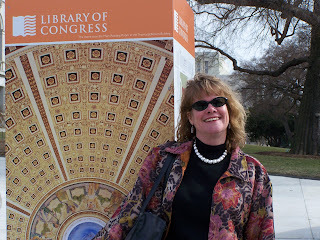 I can't resist posting some photos of my time at the Library of Congress. 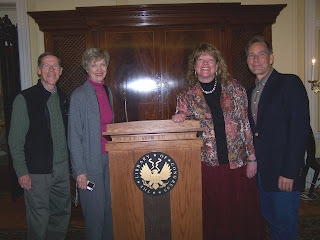 I'm not sure this is the best shot of any of us (l-r: Dad, Mom, me, husband Carl), but I love the Library of Congress seal on the podium. 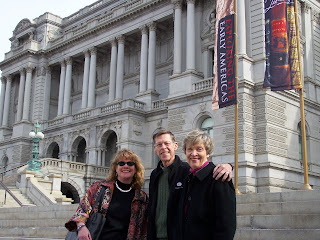 Here I am with my mom and dad outside the building--what a magnificent building--I can't imagine how it was crafted and wonder if later generations will say the same about buildings we're making today. 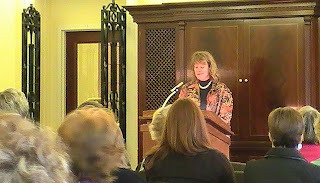 Here I am, inside, during my reading (this was taken with a different camera; I'm not as crazy about this image). Here I am outside the building, beside one of the signs (like the one that you can see in the distance in the other post). I love this photo--I think of it as the character I would be if I was in a 70's sitcom--the kind of show for the thinking kind of guy, the liberated kind of gal. You can almost hear a theme song playing in the background, something about making it after all . . . I'm back from Washington, D.C., and I'm pleased to report that the Library of Congress reading went well. We took the Metro into the city--ah, to have a public transit system that works (of course, I've been reading Washington Post stories about when it doesn't work well, but happily, we had no problems). There were no long lines waiting to get into the Library of Congress--now, you must have your belongings sent through the X-ray and you must walk through the same kind of detector as one goes through at the airport--although we didn't have to take off our shoes, jewelry, and belts, the way we must now at the airport--we gave ourselves time in case there were long lines. The building is just gorgeous; they truly don't make buildings like that anymore. Of course, there are some other Library of Congress buildings that were built later, and they have that 60's-sterile-concrete kind of look. Happily, my reading was in the more historic building, in a smaller room, with colonial furniture and decorations.I read first, and it went well. The other 2 poets also had good reading days. I was interested in how well our love poems worked together, as if we had planned and coordinated. I think there were about 75 people there, and only 10-20 were there because they had a connection to the poets. There was a Congressman from Washington State and his wife. Most of the crowd seemed to be people on their lunch hours who had walked over from federal buildings as well as some retirees. Very good energy in the room. Everyone asked me if I was nervous, but 20 years of teaching really prepares one for this kind of thing. I've had much more hostile audiences in the classroom. And even though I don't usually read my own work to students, I read work that I love better, and so it hurts more when hostile students mock the work. All in all, it was a marvelous experience; I can't imagine how a poetry reading could have a more magnificent setting! And the audience was great, but I have yet to find a horrible audience. People who come out for a poetry reading, whether it be at the Library of Congress or a local library, are just a different breed. An article about me in the Miami Herald! There's a story about me and my poems in today's Miami Herald. To read it, go here. I was interviewed last week, and I thought it went well. Of course, Nixon probably thought everything went well each time he was interviewed--from my college newspaper days, I remember that the best interviewers make everyone feel that the interviewer is on their side. On the other hand, I was being interviewed because I'm reading at the Library of Congress, not because I'm under indictment or because I accepted limo service and didn't declare it on my taxes. Wouldn't it be great if poets had to worry about all the goodies they get, and whether or not they're tax deductible? On the other hand, we have non-taxable rewards. The world shimmers with symbolic possibilities that most people would never consider. The other night, I was working with my Poetry Workshop class on line breaks and stanzas. I always bring in poems of my own, written in paragraph form, and have them rewrite them with line breaks and later, with stanzas. On Thursday, one of my poems referenced Ash Wednesday, and since I like to explain how I come up with ideas, I had to explain Ash Wednesday. That led to some interesting information about pets at Ash Wednesday services and pet baptisms (I wrote about that concept in more detail at my other blog--go here if you'd like to read more). Then, after we've had fun with my poems, it's time for students to do the same thing with their own work (or if it's a beginning class, I let them continue the experiment with the work of others). With so many people about to leave town for the AWP convention (some day, some day, I'll be there) and cold and flu season upon us, I thought I'd post the exercise instructions here, in case others would find it useful. It would be easy to cut and paste, and voila! Instand handout! So, here's a handy exercise, for days when you need your students to be busy, without much input from you. I think it might even be useful (perhaps with some modifications) for Composition classrooms--you could have an interesting discussion about which words deserve emphasis and how poetry composition gives one different options than prose. And in Literature classrooms, I've always claimed that one learns as much from trying to write a type of literature than trying to write a piece that analyzes a piece of literature. This assignment will consist of 4 parts. It will probably be easier if you do it on the computer, so that you can play with lines and stanzas, without having to do much retyping. You may use a piece that you’ve already written before, or you may write something specifically for this exercise. You may also use someone else’s poem; just tell me who wrote it. You will be working with the same chunk of words for parts 1, 2, and 3. You probably need a minimum of 150-200 words to have enough flexibility to do this assignment. Don’t try this with haiku! Please clearly label each part that you’re turning in. Part 1: Write out the words in paragraph form. Part 2: You will not break the words into stanzas. But you will break the paragraph into lines. Part 3: You can keep the lines the same, or you can experiment with different lines. In addition, you will experiment with stanzas. You must break your experiment into 3 stanzas—or more. Part 4: Write a brief analytical essay (at least 500 words, or 2 pages) that explains the choices that you made, and how well you thought they worked. For example, in part 2, how did you decide how each line should end? And in part 3, how did you decide which chunks belonged together in each stanza? And most importantly, as you look at each part, which one do you think works best as a poem? Explain. The Library of Congress website is updated, and there's my name. What a thrill! Go here to see it. I've been sorting through poems and thinking about love. Here's one of the poems I'll be reading. The inspiration came in 2000, as I heard geologists on NPR talk about Mt. St. Helen's explosion twenty years earlier. It was published in A Summer's Reading. life explodes. That clean mountainside crumbles. Stress builds, and the volcano explodes. the disaster we thought we could avoid. but the mountain swallowed them whole. And yet, life struggles on, swims towards continuity. away the undergrowth that took eons to grow. Kelli has a great post at her blog, where she considers rejection and thinks about some of her self-defeating behaviors. I particularly love when she says, "Do not listen to the voice inside your head that says you are not good enough. I don't believe there's a devil, but if there is, I believe he's a poetry critic." For me, my self-defeating behavior seems to come in cycles. I go for months where I work out a good balance of writing new work, revising/typing into the computer new work, and sending out poems and manuscripts. Then something schedule related happens (often a work crisis or travel or a bad cold), and I'm off balance, often for weeks at a time. At least now that I've been writing awhile, I can recover more quickly. And I often realize that I'm off balance sooner than I once did. Of course, I can't always do anything about it. But I try not to sink into despair. I try to remind myself that my muse is always there, waiting patiently for me to return. Even when I can't write, she's noticing connections and taking notes. One advantage to my move into administration, which requires that I be in my office for 40 hours a week, is that when I have a pocket of free time, I seize it. I'm like a woman whose child takes an extra long nap, and she's ready to hit the computer. I'm much more focused because my schedule demands it. I don't have the luxury that I used to have as full-time faculty, the luxury of saying, "Well, I don't really feel inspired today. I'll write/revise/send out tomorrow." Nope, I probably won't have time tomorrow, and the next day's looking pretty full as well. When I have time, I leap right in, often with ideas I've been saving for days, weeks, until I have a free moment to compose. Even if we can't be writing/revising/sending out, we can be strategizing so that we're ready to go. We can imagine ourselves sealing up those envelopes. We can think about the images we're going to use in a poem, the next time we get a breath of free time to write them down. The most successful athletes use this mental imaging technique to get better, even when they're not physically training. We can learn from them. I've been waiting a long time to read Fourteen on Form: Conversations with Poets, edited by William Baer. I would have bought it in 2004, when the University Press of Mississippi first published it, but it cost in the neighborhood of $50--that's a lot of money for 250 pages. I decided to wait for the cheaper version. And I've been waiting. Finally, I ordered it through Interlibrary Loan. I wanted to read it because I was interested in the fact that all these poets were chosen because they work in form. However, that part of the conversation wasn't as interesting to me as I thought it would be. I thought I'd make note here of some of the tidbits I've picked up. I was most interested to read that Donald Justice isn't always a fan of revision. On page 90, he says, "As time goes by, you change your attitudes and beliefs--your aesthetic beliefs. At one time, you might prefer this version, and the next time you might prefer another version because your ideas have changed at least somewhat--always taking seriously what is said in a poem and how it is done as well. Nevertheless, I think a lot of revision is a waste of time, a sort of solitaire." I felt a sense of relief as I read that. I don't spend much time on revision, the way that some poets say that they do. I may change a word here or there or tinker with stanzas. But if I take a free verse poem, and change it radically, say turn it into a villanelle--in many ways, it feels like a completely different poem to me, not just a different version. The interviewer asks Anthony Hecht about Derek Walcott's practice of having his students pick "a notable poet from the tradition and [write] in imitation of his work" (70). Hecht thinks it's a good idea and also suggests that memorization is a good idea. It's hard for me to imagine my students accomplishing these tasks, but some part of me wonders . . .
John Hollander talks about how we learn about rhyme. He blames it on popular music. He mentions serving on a committee with Steven Sondheim and lamenting the fact that so many people can't rhyme. Sondheim said, "That's right, they all come from rock music. Anyone whose background is in musical theater knows what rhyme is" (page 223). He also talks about church music, which once upon a time would have been some of the earliest poetry we all learned by heart: "Hymnody is very important, and look what's happened to that! How it's totally fallen apart. The churches are full of 28th-rate rock groups singing smarmy tunes, and they've thrown away all the great traditional hymns. It's terrible" (223). Amen! I found this book fascinating, but not fascinating enough to shell out $50 for it. Why hasn't this press put out a more affordable version? I just read a great interview over at the 32 Poems blog. Serena M. Agusto-Cox interviewed Andrea Hollander Budy, and as with so many interviews, I come away feeling like I've learned a lot. 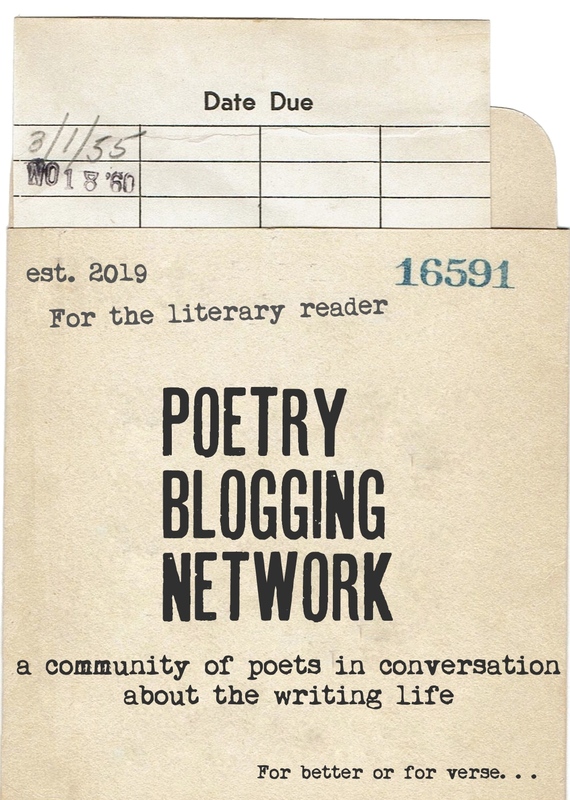 Budy talks about how she's learned to be a poet not from enrolling in an MFA program or reading how-to books, but by reading volumes of poetry, primarily from the 20th and 21st centuries. She's been editing an anthology of contemporary poetry by American women, so she's been quite immersed. Her description of her study leaves me with a case of envy that borders on covetousness: "I sit on a couch surrounded by windows on three sides. Across the room is a three-sided desk with plenty of surface space and, on one wing of the desk, my computer. Floor-to-ceiling bookshelves fill two walls. This room is indeed an ideal writing space." Of course, I remind myself that my 23 year old self would be staggered with jealousy if she could see the study in which I write now, and she would be beside herself to realize the computing power I now have, which she did not (I wrote on a Smith-Corona Portable Word Processor for all of graduate school. The disks held about 25 pages, and woe to you if you went over the limit without having saved recently). It's a great interview, which makes me want to know more about her work. Go here for the full interview. God as Writer, Writer as God? This morning, I heard a great show on the Speaking of Faith program. Krista Tippett interviewed one of my favorite writers, Mary Doria Russell. She had fascinating things to say, and she focused primarily on her book The Sparrow, where she created a brand new world. This God-like exercise made her think about God, free will, creation, and led her back to faith--she calls herself an agnostic Jew. Go here to hear the interview and get access to lots of other information. I found myself identifying with what she said. When I write fiction, especially novels, I often find my characters going in directions I didn't anticipate. I had declared that I was done writing love stories when I wrote my last novel--but when the two main characters fell in love, it made so much sense to me, and I didn't have the heart to send them on the alternate path I thought I had chosen for them. Even if you have little tolerance for religious conversation, I think you'll find much of interest in this show--it's a fascinating insight into a writer's mind.